grouser (Ludlow, United Kingdom) on 11 December 2018 in Documentary & Street. Ah, simple delights are the best . . Yes indeed, big shower in this case! Now that is a bubble. Excellent capture. Aw! That's sweet...there's a baby too in a stroller !! ...:-) I enter inside ! Great capture ! Happy ST ! It must be fun ! I mean, it's fun to be silly ! Happy ST ! That's HUGE! Excellent photo - just look at the excitement of the onlookers! Wow!! 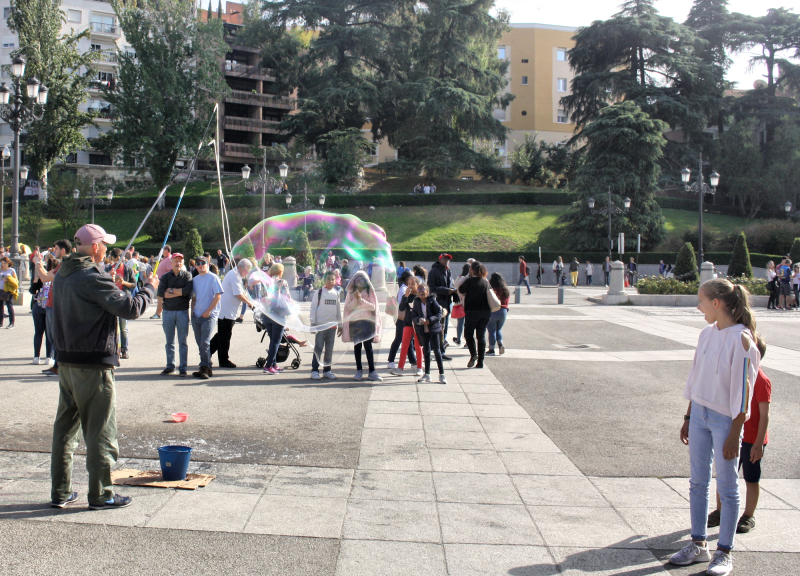 What an intereSTing way to create these huge bubbles! It looks like he's fishing. That is a grand bubble and you caught it just in time, I'm thinking. Funny and sweet how some soapy airborne objects can transfix and please a crowd. Nice street pic. That is a really big bubble! A great image! Happy ST!